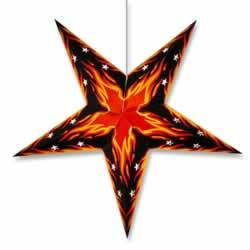 The Harley rider on your list will love this star! Black bacground with glowing orange and red flame design. Star Lamp measures about 24" from tip to tip. 5 points. Includes simple assembly instructions. Shipped flat. 12' electric cord with on/off switch optional for $6 more. 40 watt light bulb not included.